The teenager's parents and friends say he was relentlessly bullied for his sexual orientation and race. An openly gay teenager committed suicide in Pleasant Hill, Iowa this weekend — the fifth student to take his own life in five years at Southeast Polk High School, according to KCCI News 8. The 16-year-old's mother said she believes antigay bullying was partially to blame for her son's death. "It must have been really horrible, if my son got to the point where he would hurt my husband, my daughters and I to take his own life," Sheryl Moore told KCCI. Moore also said that her son told teachers and administrators about the harassment on multiple occasions, but no one took any action to help the teen. Moore's son, AJ Betts, reportedly attempted suicide on Friday, and was on life support over the weekend. Doctors and the family planned to take Betts off life support today, according to the Des Moines Register. 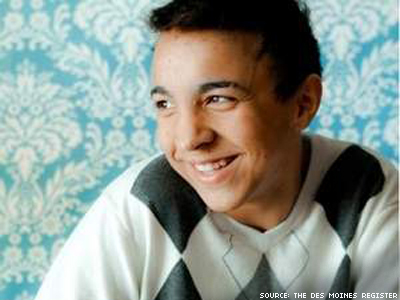 Moore told KCCI that when her son was outed as gay a year and a half ago at Southeast Polk, he was relentlessly bullied for his orientation, his mixed-race heritage, and being born with a cleft lip. "He's different," Betts' best friend, Noah Lahmann, told KCCI. "He doesn't add up to what they're used to." Moore says she hopes her son's death can help prevent similar tragedies, the way Betts apparently helped other gay classmates who were struggling with suicidal thoughts. "Several people who are gay or lesbian teens have told us that AJ saved them from committing suicide when they were feeling desperate," said Moore. "Bullying is a big deal, and it's still happening. And I really hope, for AJ's sake, that we can stop it. Even if we could save one more life from bullying, that would be a success." Southeast Polk High is hosting a memorial service for students and faculty to remember Betts at 7:30 p.m. on Tuesday, where counselors and mental health support staff will be on hand to assist those in need. Watch a video from the Register below. If you or someone you love are struggling with depression, bullying, or suicidal thoughts, reach out for help now. LGBT youth can contact The Trevor Project's confidential, 24-hour Lifeline at 866-488-7386. Find additional resources at StopBullying.gov, or contact the National Suicide Prevention Lifeline at 1-800-273-8255.